This stone is named for its Picasso like markings ans is believed to assist in creativity development. Also called Picasso Marble, is believed to have strong metaphysical qualities of grounding and calming. Beads range in colour from blue greys, greens and brownish reds. 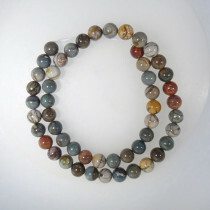 Picasso Jasper stone Round 8mm (~50pce Strand) - 40cm/16'" Strand. 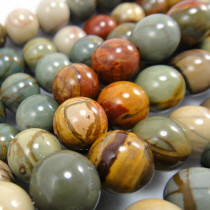 Picasso Jasper Round 10mm Gemstone Beads (~40pce Strand) - 40cm/16'" Strand. 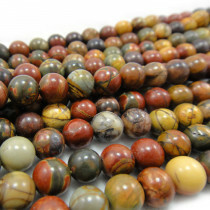 Picasso Jasper Square 12mm Gemstone Beads (33pce Strand) - 40cm/16'" Strand. 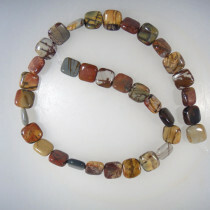 Picasso Jasper stone Round 6mm (~66pce Strand) - 40cm/16'" Strand.